Stuck with Category Theory notation. What is the meaning of 'Corner brackets' ｢ ｣? I was wondering if anyone knows what does the corner brackets ｢(upper) and ｣(down) in this expression do? From the nature of the equation I suppose that there is a bifunctor lurking around, but I cannot be sure with the limited amount of details provided. Not the answer you're looking for? Browse other questions tagged category-theory adjoint-functors monoidal-categories or ask your own question. What is the formal definition of a dual category? Why was set theory inadequate as a foundation to the emerging new fields and why category theory isn't? What is a “foo” in category theory? What's the best way to teach oneself both Category Theory & Model Theory? 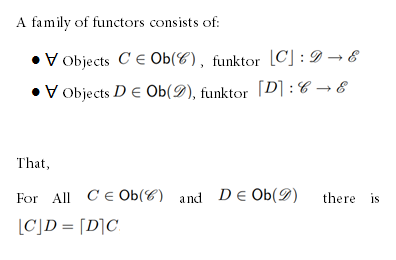 What does functor definition in category theory mean? What does it look like to “do math in category theory”?